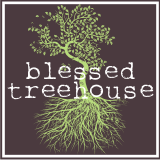 Blessed Treehouse: I can't make this stuff up. "Okay, now let's go to my room because that's where I'm getting pregnant." After I regained consciousness, I learned that Harper intended to get pregnant by taking a baby doll from her room to put under her dress. We have since had several pregnancies and deliveries, resulting in a nursery full of beautifully-quiet plastic-headed glass-eyed newborns. My heart has still not recovered.